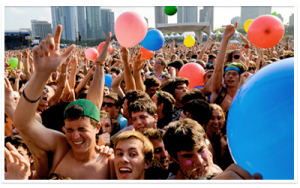 Looking for a Lollapalooza hotel in Chicago for August 1-4th 2019? The LaQuinta Inn & Suites Chicago Lake Shore is just ten minutes from the main stage and offers a free shuttle and free parking which can save you up to $50.00 a day. The hotel is also just two blocks from public transportation to Grant Park and Hutchinson Field where the events will take place. Lollapalooza is an annual music festival in Chicago, including but not limited to alternative rock, heavy metal, punk rock, hip hop, and electronic music bands and artists, with dance and comedy performances, and craft booths. It has also provided a platform for non-profit and political groups and various visual artists. This years lineup will be headed by Ariana Grande and is expected to bring over 60,000 people for the four day event. This Lollapalooza hotel in addition to its great location overlooking lake Michigan and offering great rates includes free breakfast each morning. Its also within blocks of shopping and restaurants to satisfy your needs at a reasonable cost. Check out the great rates, save some money and enjoy all that Chicago has to offer.